Today I wanted to share the big changes we have seen in Gideon as a direct result of the love he has been given from Gideon's Army! Gideon is only four, and was only three when he was diagnosed. And although he seems relatively healthy, the large facial scars definitely announced to compete strangers that something had happened. They invoked awkward and sometimes unwanted attention from strangers --some curious, some rude, some sympathetic. They changed Gideon. He no longer wanted to go to even his favorite places like Home Depot with daddy or New Seasons for donuts. When we would take him out, he would hide in the cart. When we'd take pictures, he would cover his scars with his hand. He had never met another melanoma patient. Even at St. Jude, no one he met had large facial scars. And as parents, we had never met other parents dealing with the same issues, but we were able to glean a lot of information and comfort from a small facebook group of parents. But even so, they were far away. Not knowing what else to do, we had some little business cards printed that told Gideon's story and challenged people to give to others, since Gideon loved to give gifts to every "friend" he met - usually Hot Wheels. It helped a little. It occupied his head and hands when we would go out and gave him something to think about so he didn't notice the longer-than-appropriate stares. In response to a question or comment, he would simply hand them a card. Then, we were given this huge Make-A-Wish party where complete strangers showed up - over 600 cars and thousands of people there all for Gideon. He didn't cover up his face in any of the photos. He freely talked with everyone asking "How many horses this thing have?" or showing off his new trophy and wagon. He had the time of his life as he strutted through row after row of cars wearing his new cape and pulling the wagon filled to the brim with Hot Wheels, T-shirts, and other gifts "his army" had given him. (continue reading the letter below the picture). And it changed him. Since then, he hasn't hidden his face once. He hasn't mentioned staying home or seemed to even notice the comments of strangers. We have great pictures from his wish trip that show him smiling, and not covering his face! He has spent hours sorting through Hot Wheels and getting them to the right people. Children in Mexico, Haiti, Ethiopia, and India have all received cars from Gideon. 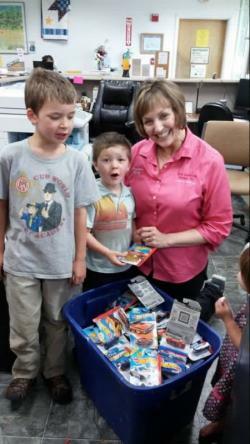 Children at Doernbecher, Randall and St. Jude have also been given cars. One twelve year old boy in the Houston airport cried because he was given a car at a very difficult moment in his life when he had just gotten bad news and the car helped him feel better. Every time we pack up a car to go, or place one into the hands of a child, we pray that it will encourage them in some small way - just like we have been encouraged by those that entrusted them with Gideon. He also spends hours of each day playing with the cars that he has kept for himself or studying the collectible ones that stay in their packages. He still talks about that huge car show whenever we visit the Home Depot and asks to look at pictures almost daily! And as a result, he met Shelby, who lived just one town over and is a beautiful young lady today, but could relate to him. She too had melanoma and had a lot of surgery on her ear and face and neck. Her scars look great. She let us stare for much longer than appropriate and study and we still couldn't really see the scars. It encouraged us so much more than you can imagine! Now, in September, we have the chance to go to Grapevine, TX and meet a group of melanoma patents and their parents. There are 3 or 4 that have facial primaries like Gideon, one from Texas, and two from California that I know of! People that we would never otherwise get to meet. I will have time to talk to their parents about how they helped their children deal with this. Ironically, all of them were diagnosed at about the same age, but two of them are much further along in their journey! Gideon will have time to play at Great Wolf Lodge with other kids that have the same scars. The entire conference, hosted by the Melanoma Research Foundation, is free. They will pay for Lodging and many of the meals, but we have to get there. And that is why when Daniel, who is organizing the Battle Ground Harvest Nights Car Cruise asked if there was something they could do for Gideon, we thought of this trip. It simply wasn't in the budget, with so many other priorities this year. We are so grateful for everyone that has helped organize this and we are really looking forward to it! We hope to see many of you there - wearing shirts if you have them! But either way, I want you to know that you are making a huge difference! My little boy is more confident. I always knew that I wasn't alone, but God has used every one of you to remind me just how loved we are. Thank you for loving us in such an incredible way!